It was approximately 358 BC when Plato founded the Akademia, first institution of higher learning. It’s useless to say that at that time education wasn’t attainable for all the people. The world evolved in the next 2300 years and education became approachable for anyone interested. Education became a universal right and society progressed along with it. More than that, along with society development education developed many branches according to nowadays requirements. Primary education can be found almost in any human settlement, any region has a high school and some cities have even more high schools, not to mention the big cities that have at least one college. The world evolved indeed and we are witnessing its evolution. As you sensed from our introduction, there’s no evolution without education and education evolves accordingly. This statement is not novelty for none of those who read this. It’s a fact that couldn’t be more obvious than it already is. Along with education development, more and more education providers appeared to satisfy the demand. It sounds like an economy class but we must face the facts. It’s all about economy. With competition growing, all educational institution felt the need to improve their appearances in order to attract more students. Going online was a small step in this world of competition and what is more interesting is that it didn’t happen recently. It’s years since educational institution are offering a detailed description of their work, of their results, of students results in the online environment. Why is today more special than yesterday? Maybe because of the looks. An ancient activity becomes new and more interesting with the proper presentation. To sustain this, we chose a few themes that perfectly illustrate the model of an education project. It is not a coincidence that we start with Academy. The old ancient Greek name and the idea of online learning are best proof of education’s evolution. 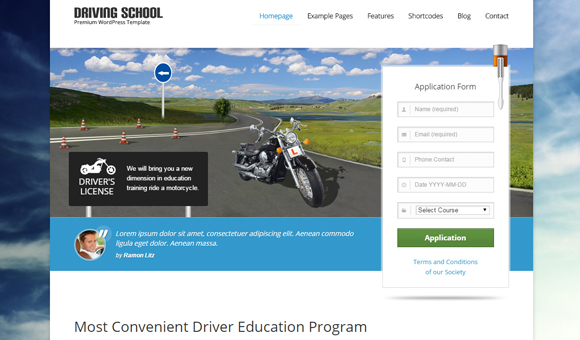 All in all a serious theme that offers exactly what is supposed to offer – educational plans. 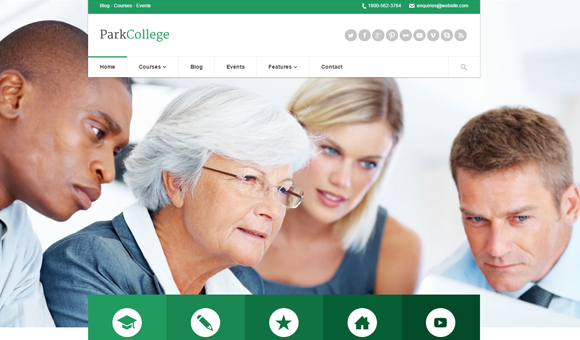 Education is a classic example of how an education website should look like: simple, serious and right to the point, providing exactly the information needed for any interested student. Sometimes offering as much details as possible could be the winning card. My College is one of those websites that will not leave any question unanswered. It sure attracts students to education. When so customizable a theme couldn’t be anything but a success. 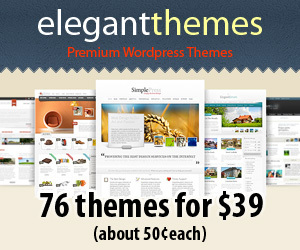 Any client in search for a theme will appreciate the theme as if they were more for the same price. With all education features included, it comes with a plus in multitude of ways of presenting them. 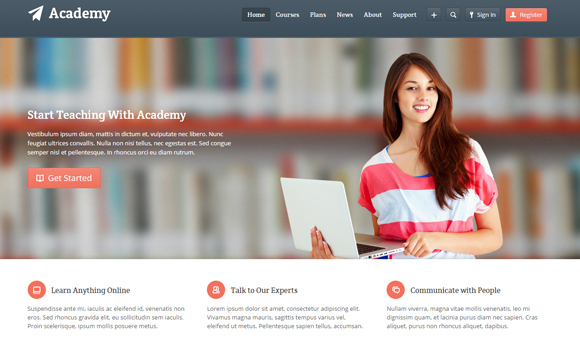 Often described as minimal, this type of theme offers more than needed for a small business. Again, although described as fitted for small businesses, its adaptive construction can fill any requirement in the education area. 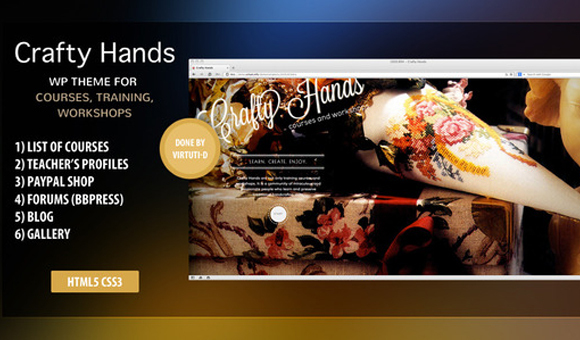 As opposite to minimal websites there are multipurpose themes. The big advantage of such a theme is that it may be fully customized according to owner’s needs and users’ requirements. All in all we have a complete theme that may become the perfect theme for educational projects if needed. 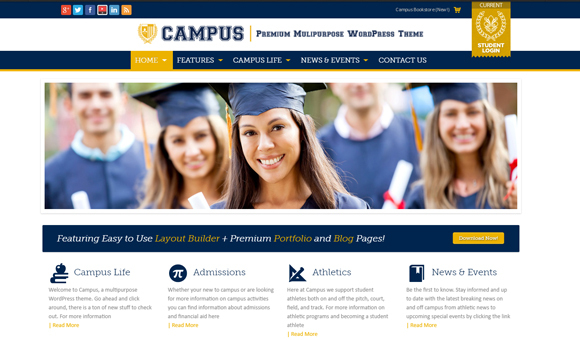 Just when we were talking about multipurpose themes, it comes a theme special built for education projects. This fact is forcing us to say that when it comes to education there is a word than can describe better this theme than any other – complete. There’s nothing more suited for online curses than a fresh, modern looking website. At this chapter we couldn’t skip WPLMS. 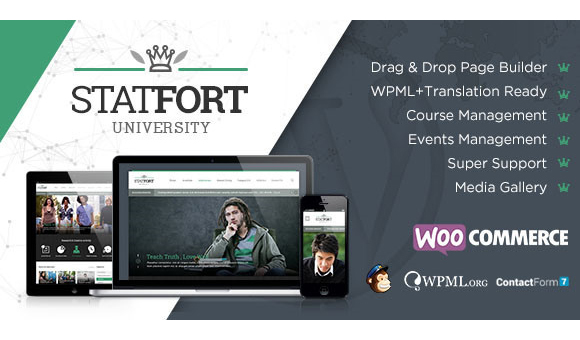 Since online courses are more and more used, a website like WPLMS represents the future of education. The big words used in the prior statement are well covered by this modern theme. Don’t take it for granted; check it yourself. Statfort brings us the perfect mixture between classy and modern, between traditional and nonconformity, between old and new. All in all it brings us results. 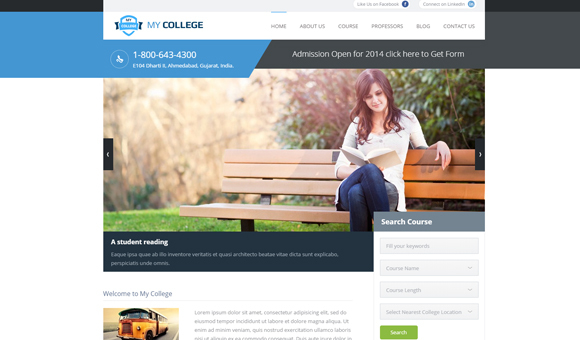 A website looking like this, with so many features and with so many customization options can be only a hit. Universe is another example of classical adapted to modern environment. As any other theme special built for this purpose it gathers all required features combining them in a modern theme. This is what complete really means. There is no area in education that University doesn’t cover. 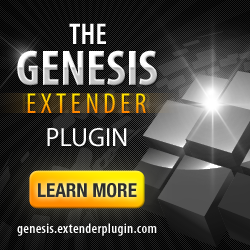 And if you find any, the flexibility and customization option will allow you to update it. Just when you say you found the theme, another one comes more powerful and more complete. 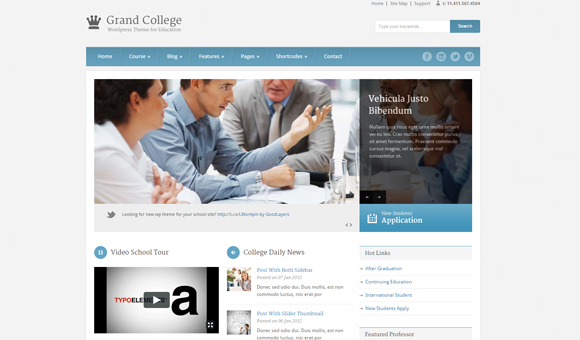 Grand College has all ingredients to compete for the complete education website. It inspires education. 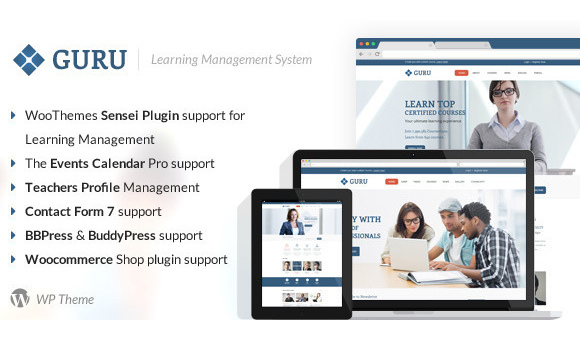 Another learning management system is Guru. 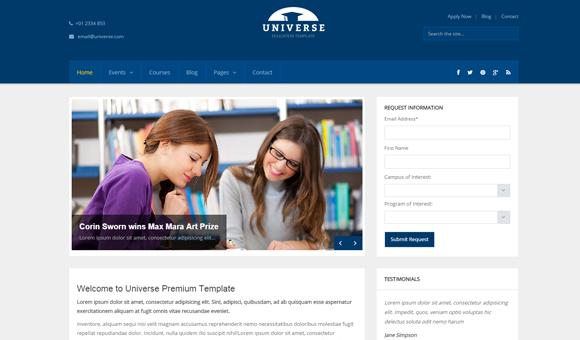 This theme will help both students and professors. In the online courses area, it sure has its place. Take a look and let yourself taught. 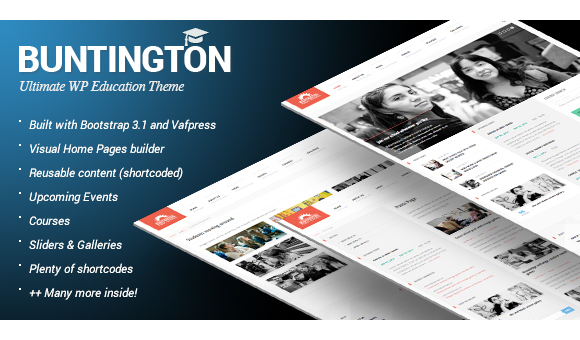 Buntington is another website built for education purposes. It gives all the necessary information in a manner accessible for any user. Well structured, sober, it looks exactly as an education related project. 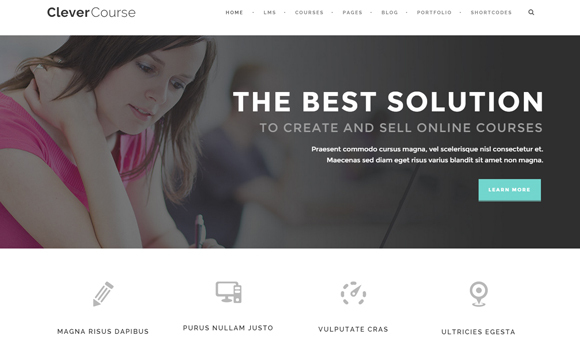 When it comes to online courses, Clever is definitely the clever choice to make, if you allow me the pun. 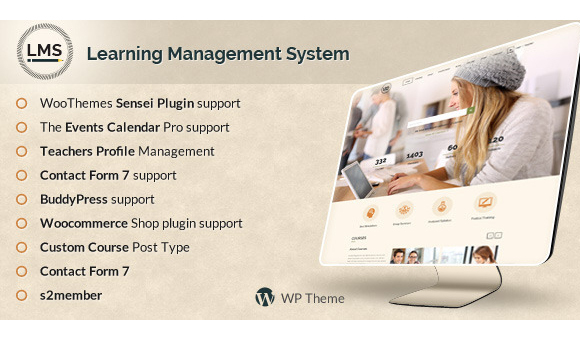 Like many other competitive themes it gathers all the features an online learning management system should have. Offering a multitude of choices for courses presentation, selling or buying it is for sure one of the best themes in this category. 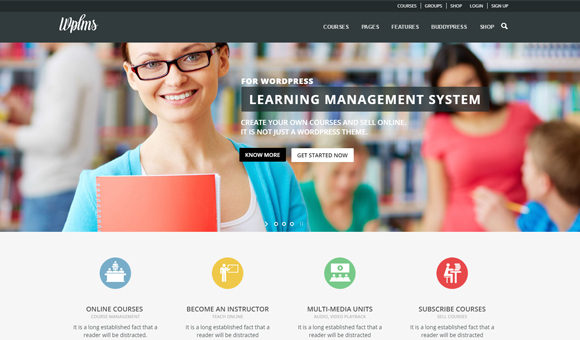 LMS is another mesmerizing theme created for the online learning area. While other websites are giving a modern look to the old idea of education, LMS gives a classy aspect to much newer idea of online learning. 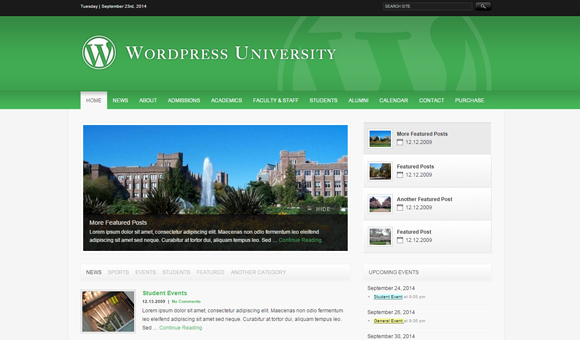 Since University is a common name among education themes, we chose a theme with the same name as a prior one. Is there any room for comparison? Sure, but this is not our purpose. 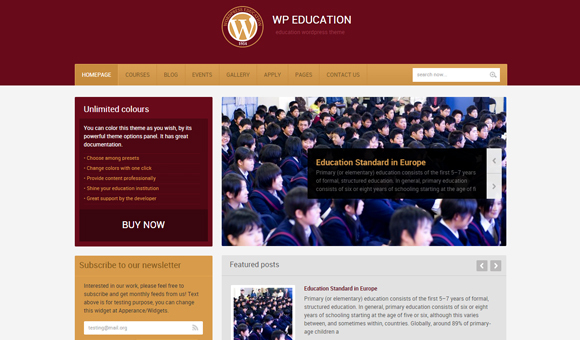 We are just glad to present you another amazing theme. 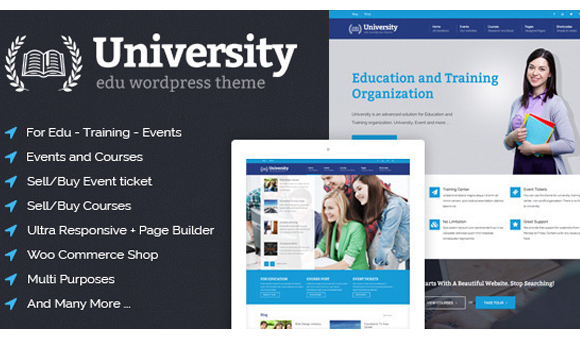 With a dynamic look, University fully showcases the meaning of modern. Should we say that it comes with more variants? A fresh perspective on a branch of education is always welcome. That is why we chose Crafty Hands for this list. It doesn’t differ much on the other themes but it has something special. A dynamic perception on learning, a new vision, these are only a few of the characteristic of this theme. 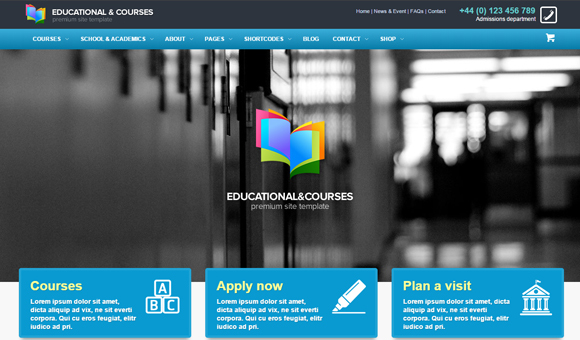 In order to cover more areas from educational field, we chose to showcase here this theme also. 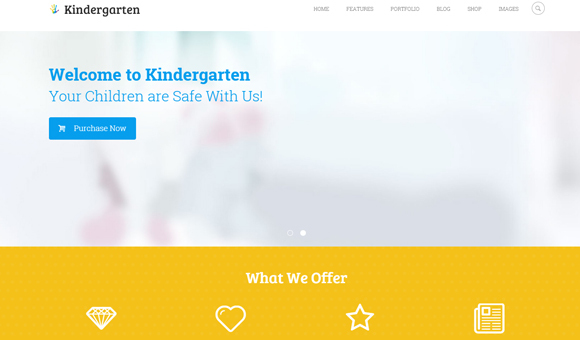 Kindergarten is close to any other education related theme when it comes to information provided. The major difference lays in its look. It couldn’t be other than joyful and colorful as a theme related to kids should be. Let’s remain in children’s education area with Carry Hill. As intended, it suits for elementary schools. Comparing to previous themes we observe the mixture of seriousness required for colleges or higher education institutions, but it slips a little of childish in its structure. As stated at the beginning of this post, evolution requires education and education requires evolution. In a changing world the power to adapt is essential. The themes we showcased here are only a few examples of how education should or could appear online. Also for evolution reasons, we will gladly wait your opinions regarding this issue. As in Plato’s Akademia, more than 2300 years ago, dialogue will guide us to progress. And even for a more crowded and interesting dialogue, share this post with your friends on social media.